There's nothing as fickle as fashion, in poker as in life. One particular fashion has changed dramatically in the last twelve months. This is the relative popularity of the smaller re-buy tournaments in established casinos. The principle behind their attractiveness was simple enough. For hopefully a relatively small outlay there existed the possibility of a good return by finishing high on the final table and scooping your share of the plentiful re-buys of other players. However in the last year there has been a backlash against such competitions particularly amongst the newer player. Many times across provincial casinos you can be sitting quietly in the bar area overhearing a familiar refrain "I brought £50 with me but there's a geezer on my table who's had 15 re-buys and I can't compete. He got me in the end of course and I had to start again" or "these guys aren't playing poker they are gambling" or "there's a fella on my table who moved all in blind for the first eight hands". Now of course for the experienced player there are a variety of perfectly legitimate ways to play a re-buy period. 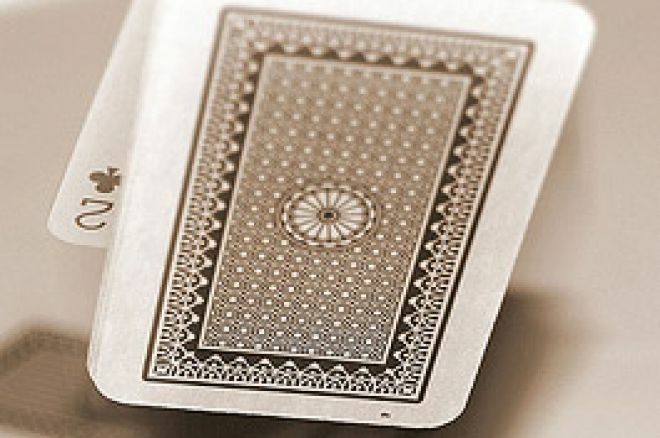 After all the aim is to obtain at least a workable stack for the competition after the conclusion of the re-buy period and their experience has taught them that sitting tight waiting for premium hands doesn't do help that as their frequency is too low to achieve their aim, a big hand might get cracked anyway and the pattern of play is all too predictable. So instead there is greater utility from playing "funky" hands, hitting unexpected flops and gambling where necessary. All this led to some interesting results. Firstly numbers of runners started to stagnate in these re-buy tournaments and the same players began to redistribute prize pools amongst themselves depending on the short term variance of results. Secondly new competition to the established chains began running cheap freeze-out competitions which were proving very popular with the newbies, with a limited and predictable outlay and a sense that they could play unintimidating and "proper" poker. Thirdly I noticed that the standard of poker in the traditional venues began to wane. No new blood was entering the tournaments to sharpen up those with bad habits and around festival time, put very simply, some players had forgotten how to play freeze-outs. They were impatient and they missed their quick fix of action. Not surprising when their local casino's staple fare was seven nights a week of cheap re-buys! Since then I have noticed a new response in the last three months. The casinos have started to fight back. In my local area two casino chains now run deep-stack freeze-outs. One venue, a Stanley casino, runs a £50 freeze-out once a week with 10,000 starting chips and a long clock. It is sold to capacity every week. In response the local Grosvenor has plans for three freeze-outs a week, one a deep-stack and two being sub £100 buy-ins. Initially for the first few freeze-outs numbers were in the region of 65-75 people. The re-buys were attracting 25-35 runners. Elsewhere the Gala casino chain has introduced freeze-outs twice a week but to a slightly different theme in that the competitions are structured with a quick clock minus some levels. Designed to appeal to the social player who wants a quick game after work and then home at decent time for the next morning the competitions are typically finished by midnight but have been selling out across several casinos. Also this week it was interesting to see that a Grosvenor casino has agreed to host an APAT event. The proposition for players is a sub £100 deep stack long clock freeze-out. The last event sold out in under half an hour! Now that the major chains appear to have "got it", there has been a resurgence in numbers of players attending the provincial poker tournaments run by the various casino chains. Give the punters what they want and the popularity of poker ensures that they will turn up. At the moment they want cheap freeze-outs. Some care about a "playable" structure, some clearly don't but vitally for them their potential outlay is capped. No doubt a few of these newer players will progress up the ranks to bigger tournaments and no doubt will have a better grounding in the fundamentals required than a steady diet of re-buy gambling. In any case the player pool available to all providers expands as the fare on offer has more variety and appeal to all types of player. Of course there is a way to go. Some venues are way behind the progress being made elsewhere. In some you still have to endure "re-buy bingo" if you want a local game. There is no alternative. Perhaps you might have to sit for the time being in a poker room that allows smoking. Or sit in a cash game that is punter dealt for tips. Or watch as two friends tacitly decide not to play against each other, seemingly condoned by all the other regular players and management. Everywhere, the next stages of progress should involve added value being added consistently by venues and that service levels consistently justify the session charges being levied. Ultimately players would like to see universality of rules across venues and there are significant roadblocks to progress on this front. For the time being though, some poker providers appear to have woken up from a long long slumber.